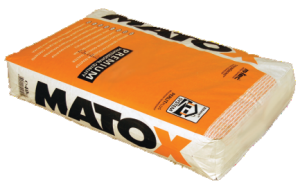 MATOX 110PG is a fine mortar for smoothing the surfaces of the construction objects already treated with MATOX 100U or MATOX 105S. The hardness of the mortar corresponds to the mortar class M1. Workability of the mortar is over 180 minutes. Before applying MATOX 110PG mortar remove any dust, grease, loose particles, algae or other imperfections. The application of MATOX 110PG mortar is done using the appropriate pump (PFT G4, G5; M-TEC M300). Dry mortar mix is continuously delivered to the machine reservoir where it is automatically mixed with water in the approximate ratio 3:1. The prepared mortar is then delivered through the hose on to the wall or ceiling surface by the pump. Once on the surface, the mortar needs to be smoothed. For best results apply MATOX 110PG as the second layer (after MATOX 100U or MATOX 105S) up to 5mm in thickness. Apply MATOX 800BK on concrete surfaces before applying mortar.